Homemade note cards and gift tags add a special personalized touch to any gift. 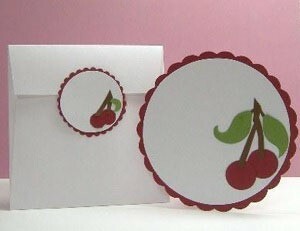 This is a guide about making cherry themed note card. This flat cherry note card with a matching gift tag is made from cardstocks in natural red, white, brown, and green. You might want to mass-produce this card as it is simple to make and wonderful as gifts. 1. Trace big circle onto white cardstock. Cut out. Adhere to red cardstock with double-sided adhesive, and trim using decorative-edge scissors. 2. Make tracings of cherries. Cut them out from red cardstock. 3. Draw leaves from green cardstock, and stem from brown. Cut out. 4. Lay the cherries, leaves, and stem on the card. When you are happy with the arrangement, glue them to the card. 5. Use the small patterns and any excess cardstock to create a tag. 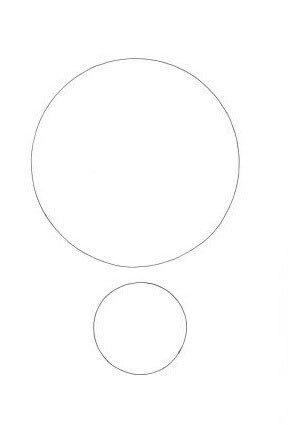 Click Here for the Circle Template. 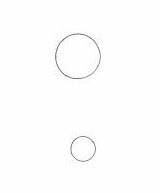 Click Here for the Dot Template.